I wanted to learn to spin for years. It seemed like something so wonderful, so creative. Nolemana and I had taken a drive over to Tillamook, and in a myrtlewood store I’d seen a lovely wheel made out of myrtlewood, that I dreamed about for years afterwards. I longed to get a wheel, but knew there was no point buying one if I didn’t know how to spin. I had to consider that I might end up hating it, even though I knew I wouldn’t. But Nolemana and I agreed that discretion was the better part of valor, so I waited. I began by signing up for a spinning class at Damascus Pioneer Craft School. Located in the original two-room schoolhouse of pioneer days Damascus, the school was filled with spinning wheels in one room, and big floor looms in the other. There was a kitchen right there, so all the students brought our lunches so that we could spend the entire day there. I loved the schoolhouse! The telephone was an ancient black one with a rotary dial, and the entryway cubbies were filled to the brim with yarn, knitting needles, fiber magazines and weaving supplies. The old wooden floors creaked when we walked on them. I was in heaven! The atmosphere inspired creativity, and even though I felt a bit intimidated as we all took our places for that first class, I felt happy I was there. There were about eight of us in that first class, and our teacher, Joane Duncan, was friendly, knowledgeable and had a wonderful sense of humor. She gave us some basic information, then told us each to pick a wheel to begin our first class. I picked an Ashford Traveller, and the two of us started out badly. I had trouble coordinating my hands and my feet (which Joane said would happen and not to worry), and the wheel made the most dreadful “yarn” I could imagine. Blame it on the wheel, right? I got frustrated and unhappy. I felt stupid. But by the next week I was spinning something that vaguely resembled yarn, even uneven as it was. Each week I got more and more proficient, until by the end of the eight-week class, I could spin reasonably well. Then I wanted my own wheel, of course. I was on a strict budget, so chose an Ashford Traditional wheel which was manufactured in New Zealand. Nolemana and I drove down to the Southern Oregon coast to pick it up (gas was much cheaper back then!) It was packed nicely in a box, and I took all the pieces out and put the wheel together all by myself. Then over the next week or so, I sanded and stained it, which was a real labor of love. Not my wheel, but mine looks just like that one. I had so much fun spinning! And when our sheep got shorn, I skirted, washed and carded several fleeces so that I could spin them. I had a lot of fun doing the entire process. Soon I had some lovely yarn that I’d spun all by myself! There was only one teeny problem. I didn’t know how to knit. So I asked my friend Else, who’d been knitting since she was a child in Germany, to teach me the basics. And pretty soon after that, I began knitting a blanket out of the fleece from my very own sheep! I was so enthusiastic about spinning that I was inevitably drawn to other spinners. And one of them had an old Louet wheel that she was going to sell because she’d just bought a new one. She said the advantage of the Louet was that it had huge bobbins, which meant that while plying two bobbins together to make my yarn, I’d end up with much longer strands of yarn. Plus, it had a Woolee Winder on it, which meant that I wouldn’t have to change hooks as I spun. The Louet came home to live with me, and I loved it! It was far more portable than my Ashford, so I could easily take it to spinning guild or the park or even just out on our lanai. My friend Sherry was taken with my spinning enthusiasm and decided she’d like to get a wheel for herself after asking me if I’d teach her to spin. So we drove out to Woodland Woolworks where she found a wheel she liked. While she was checking out the wheels she wanted to try, over in the corner I saw an amazing sight. It was the most beautiful wheel I’d ever seen. It was huge! The carving of the spindles took my breath away. I asked if I could try it, just for fun, and the owners said, “Of course you can!” So I did. On the way home, Sherry gushed about the wheel she’d bought. She was so excited! And I wondered to myself how in the world I was going to explain to Nolemana how I couldn’t stop the 31″ walnut Bill Fox wheel that somehow managed to jump into the back of my van when I wasn’t looking! Honest! In the living room, it looked like an heirloom. I put it in front of our plate glass windows, where I could spin while looking out over the valley. But sometimes in the middle of the night, I could swear I heard noises out there! By this time, I’d taken two more spinning classes with Joane. She is an artist with all kinds of interests, and one day I was telling her about the myrtlewood wheel we’d seen in Tillamook, long before I ever learned how to spin. She told me that she had one made by Joe Jorgenson of Grants Pass that she was going to sell. But I already had three wheels, and really couldn’t justify buying yet another one. Noises in the night, I tell ya!!! About two years after that, I decided to go to an alpaca show in Estacada (Estacayda, as it’s pronounced here). I had a good time wandering around, seeing the cute critters. On the front porch of the old farmhouse were several spinners with their wheels, and I went over to talk stories with them. One of the wahine was spinning on a little wheel she said was wonderful because it was so portable. It just folded up and could be carried in one hand, and was a dream to spin on. And it was for sale. Cheap. I SO did not need another wheel. Noises in the night, I tell ya. Noises in the night! This entry was posted in Other Creative Stuffs. Bookmark the permalink. OMG how cool is that I love seeing all the “spinners” It must be so peaceful! OOHHHHH – tanks for da picchas!!! Drop spindle is as close as I got, and dat was some LUMPY thread!!! I so enjoyed reading your blog. ~ I am just mesmerized by the lure of spinning and weaving, and ahhhhh IF ONLY I KNEW HOW!! 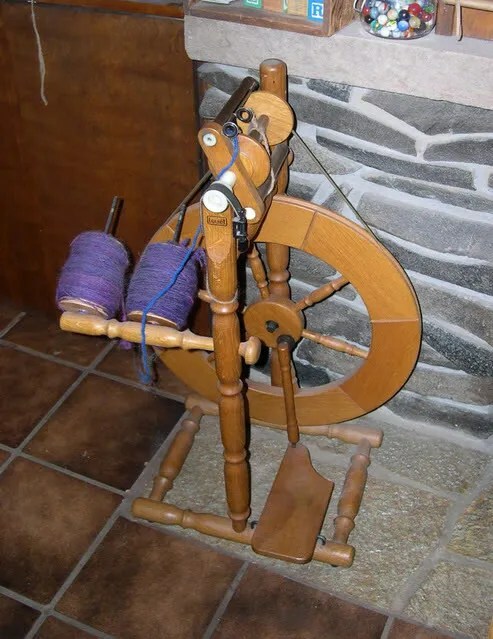 I always wanted to learn to spin… I am going to check into the sites you mentioned who have their own sheep and dye etc… I would love to buy some yarn for primitive doll hair. I will be checking back OFTEN! KEEP WRITING! YOU ARE AN INSPIRATION! Wow! So creative you. I love da wheels!! This is a beautiful post! You just brought back a lot of wonderful memories for me. I grew up with my mom spinning the wool from our sheep. My brother and I were not allowed to touch her spinning wheel until we were 12. Like a rite of passage or something. I just loved reading about this! I have a friend who has a whole farm of alpacas. She does all the shearing, then washes and cards it also. She also spins it into yarn. I always admired that talent, and she was going to show me how to spin also, but then my husband and i had to move away before i learned. Thank you for stopping by my blog and leaving such lovely comments. I am going to add you to my friend list if you do not mind. I would have loved to spin also but I gave it a go and very quickly realised that my physical problems prevented it. I think my John was relieved! If you could spare some tiem, I’d like some Hawaiian type names to maybe use on my dogs. 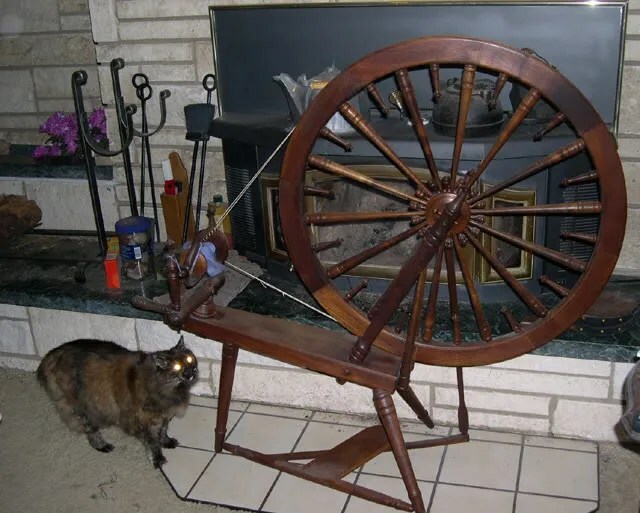 Ok… I knit but am entirely fascinated by spinning… and intimidated by the price of the wheels given what I spend on yarn and fabric… but you’re motivating me to investigate… as you did with the Hawaiian Island Cafe review. Stopped by on my way to the coast on a razor clam dig and again on the return. Nothing like a plate lunch. I just stumbled on to your blog while looking through yahoo spinlist group, nice to see another Hawaii girl out here spinning! I’m in seattle. I was just back on kauai a month ago and while waiting for my grandma at the doctors, I was drop spindeling. A few people came to see what I was doing, and here’s the funny part, I had a length of roving draped over my arm while I spun, and they the thought somehow I was UN-spinning the yarn to make yarn leis! lol Just goes to show, noone is knitting sweaters out there yet…. Those are all wonderful spinning wheels, but I have to admit I like the portable one the best. I like the idea of being able to take it on the road. 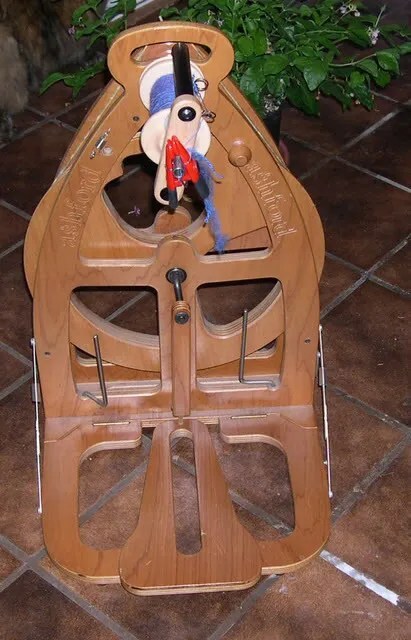 I was so surprised to see the photo of your Bill Fox wheel! I also own one and until now only knew of one other (owned by a friend here in California). I am curious to know what year yours was made. My wheel was made in 1990 and appears identical with the exception that the actual wheel portion has fewer spindles (12 large). I also purchased mine through Woodland Woolworks. I know very little about Bill Fox. Do you know anything about him….how long he made wheels, etc? Enjoyed reading your story. Just wondering how you like spinning on the Joe Jorgenson wheel. I have a chance to buy one from out of state, and was wondering what they’re like. Thanks so much! 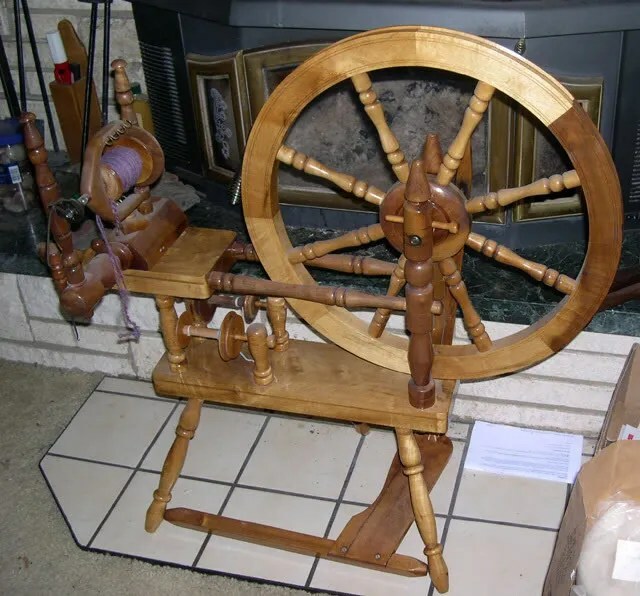 The Ashford Traditional is my spinning wheel! It’s a lovely wheel, and works very well. I am not spinning these days but one day would like to take it up again. Thanks for sharing all the lovely pictures of spinning wheels.